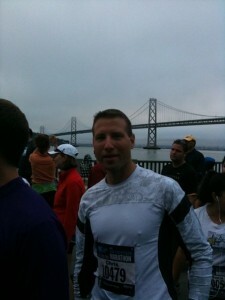 Last weekend, along with 21,000 other people, I participated in the San Francisco Marathon. I ran the half marathon distance because I wanted to be useful next week and I had a bunch of friends running that distance also. I was suppose to start in the first wave, however, I decided to start in the last wave as that’s what I was peer pressured into. It was the first time I started a race all the way in the back so the view was interesting. 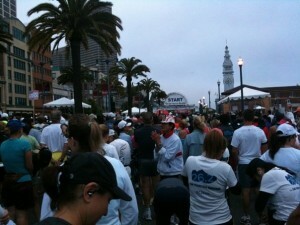 When the wave started, we were moving at a very slow pace since things were congested. After about 5 minutes, things opened up a bit near the marina district in San Francisco so I decided to take off. 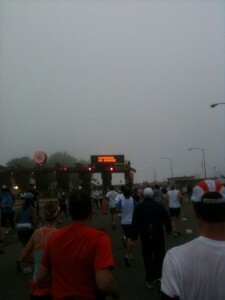 I then hit the Golden Gate bridge which turned out to be a gigantic traffic jam. It was like running a single-track trail race… very difficult to pass people but kind of fun in a strange way as you invent ways to pass people without running into someone else.